In the Netherlands, a national organised mammography screening programme was initiated in 1989 (table 1). After gradual implementation, the programme reached full coverage in 1997.15 16 Women aged 50-69 are invited to mammography every two years, and since 1998 women aged 70-74 are also invited. Figure 2⇓ shows that participation in screening gradually increased from 1989 to 1996, and after 1997 it has remained constant at around 70-79%. Non-organised screening is uncommon. In Belgium, breast screening was left to the discretion of the women and doctors until 2001, after which a national screening programme was established. Population surveys before 1999 suggested that less than 30% of women in the 50-69 year age group had undergone mammography during the past two years (for screening or diagnostic purposes).17 Around 2000, about 30% of women aged 50-69 had undergone screening or diagnostic mammography in the past two years.18 19 By around 2005 this proportion had increased to about 59% (fig 2). At that time two thirds of screening examinations were done as part of the organised programme in Flanders, and for less than one sixth in Brussels and Wallonia. Participation in screening (organised and non-organised) in Flanders was low until about 2002-3, and by 2004-6 it was still below the coverage in the Netherlands in 1997 (fig 2). 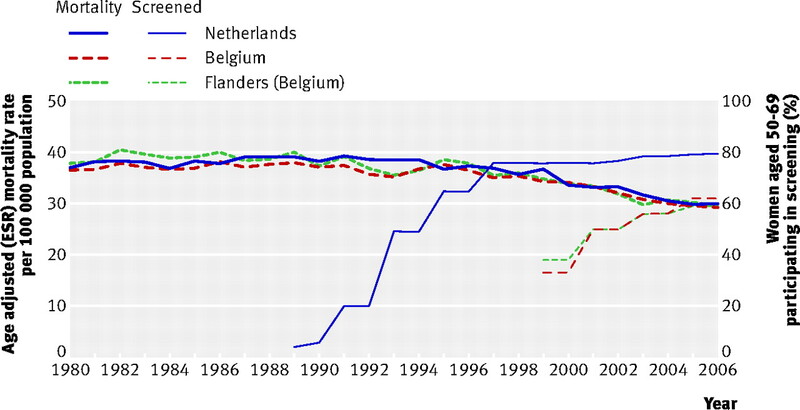 In the Netherlands the overall reduction in breast cancer mortality from 1989 to 2006 was slightly greater than in Belgium (25.0% v 19.9%) but did not differ noticeably from Flanders (25.0% v 24.6%; table 2 and fig 2). Objective To compare trends in breast cancer mortality within three pairs of neighbouring European countries in relation to implementation of screening. Setting Three country pairs (Northern Ireland (United Kingdom) v Republic of Ireland, the Netherlands v Belgium and Flanders (Belgian region south of the Netherlands), and Sweden v Norway). Data sources WHO mortality database on cause of death and data sources on mammography screening, cancer treatment, and risk factors for breast cancer mortality. Main outcome measures Changes in breast cancer mortality calculated from linear regressions of log transformed, age adjusted death rates. Joinpoint analysis was used to identify the year when trends in mortality for all ages began to change. Results From 1989 to 2006, deaths from breast cancer decreased by 29% in Northern Ireland and by 26% in the Republic of Ireland; by 25% in the Netherlands and by 20% in Belgium and 25% in Flanders; and by 16% in Sweden and by 24% in Norway. The time trend and year of downward inflexion were similar between Northern Ireland and the Republic of Ireland and between the Netherlands and Flanders. In Sweden, mortality rates have steadily decreased since 1972, with no downward inflexion until 2006. Countries of each pair had similar healthcare services and prevalence of risk factors for breast cancer mortality but differing implementation of mammography screening, with a gap of about 10-15 years. Conclusions The contrast between the time differences in implementation of mammography screening and the similarity in reductions in mortality between the country pairs suggest that screening did not play a direct part in the reductions in breast cancer mortality. Reageer op "Algemeen:screening via periodieke mammografie geeft weinig tot geen invloed op cijfers van sterfte aan borstkanker, blijkt uit groot onderzoek van WHO in landen die vroeger en later bevolkings screening toe gingen passen, zoals bv. Nederland en Belgie."